Party 13 Seater is suitable for group transfers of up to 13 passengers to anywhere in Singapore and also to Malaysia. The No.1 choice for those who want to Party On the Road. If you plan on visiting Singapore or having important clients over anytime soon, don’t forget to hire the party bus for a wonderful experience. There are many features that make this limo bus a preferable choice for a lot of people out there. It offers a capacity to accommodate thirteen people easily. So, it is recommended for people who are traveling in a group or visiting Singapore as a family or with friends. This type of 13 seater party limo bus is mostly hired for club hop or bar crawl, bachelor or hens parties, proms, company events and special occasions like weddings. The bus itself is definitely a head-turner and wherever it goes, people can’t help but be awestruck by its lights and sound systems. For travelers, it is just simply awesome to hire a party bus that is luxurious as well as comfortable and surprisingly very much Affordable. Most people now hire these disco taxi services to avoid the anxiety of driving and wasting time in reaching their destination and also knowing they will be too drunk to drive home. The party bus are equip with leather seats and executive interior design making it ideal for both business or leisure, plus ensuring our customers will Be Driven in Style and Comfort on board this exclusive party limo bus. You’ll be most comfortable and feel relaxed on your way to company events, weddings or simply for a club to club transfers. Also ideal for sight-seeing or simply a drive around Singapore as it comes with ample space to fit up to 13 passengers with hand-carry bags. Although it is one of our very exclusive limousine service, don’t worry as you can choose among our value for money packages which suits your budget well. 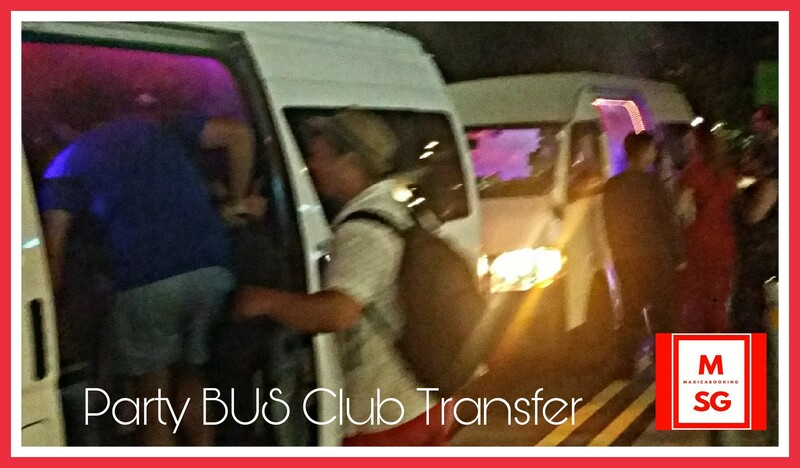 Book our party bus for airport arrival pick up plus option with the Meet and Greet services, which comes with experienced and skilled drivers who know and do their job well. Our well-dressed and pleasant driver will be at the arrival hall as of flight landed to welcome your guests on your behalf. From pick up at the arrival hall to making their way to their destinations, be rest assured all will be handled professionally by our experience and service oriented drivers. For hourly booking or charter, our package starts with a minimum of 1 hour only, unlike other type of limousine transportation that requires a minimum of at least 3 hours booking. Customers could acquire the services of the Singapore Party BUS with driver to chauffeur them around to anywhere in Singapore and even to Malaysia. This type of booking which is also known as hourly disposal are inclusive of multiple pick up and even waiting time. Plus the good news is our services are not just extended to bar crawls and parties, if you need a party bus ride to a wedding or even as the wedding car itself, do call our company for enquiries, you are sure to find the transportation assistance that you have been looking for here. This entry was posted in Party BUS and tagged birthday limo party bus, birthday party bus for kids, book a party bus now, book party bus, express party bus booking, limo party bus, party bus for bachelor party. Bookmark the permalink.